Last Friday the new Irish government reached its first 100 days in office. Like in the U.S. when a new president is in office, this is traditionally the point at which the media in Ireland assesses performance. It's a bit like a school report. And in spite of the best efforts of the Taoiseach (Prime Minister) Enda Kenny at a press conference last Thursday to look like the best pupil in the class, the report was not good. It was one of those reports that give an A for attendance and presentation, but a D for effort and performance. It was a lot worse than a "must try harder" verdict. Most of the media took the view that in spite of the genial, super-confident image that Kenny likes to project, the reality is that he and his Cabinet are failing completely to get to grips with the crisis we face. They are probably on a D, but they're not far off an F for fail. Kenny works hard at looking relaxed. He's been all smiles and good humor during the first 100 days, and his Cabinet have been floating along serenely behind him. But Kenny’s mildly amused superman persona is just an act. And underneath the surface he and his team have been paddling furiously in what appears to be confusion and panic. It's like they have all been stunned by the size of the immense task that confronts them. But they knew before the election. We all knew. The problem is that this did not stop them making foolish promises that suggested there might be an easy way out. And they repeated this stuff so often that they started to believe it themselves. As a result they have drifted through the first 100 days without really doing much, like a school kid hoping that ignoring the problem would make it go away. Now it's wake up and face reality time, both for them and for the electorate. The latest figures from the Department of Finance show that we are failing to get to grips with the situation. Between the €18 billion deficit and the extra cost of servicing our growing debt, the state this year will have to borrow at least €30 billion, which happens to be the equivalent of the estimated total tax that will be raised by the state here this year. That's total revenue from all taxes, not just income tax. To begin to turn around this catastrophic situation we need immediate, decisive and drastic action, big cuts in state spending and big hikes in taxes. We probably need another emergency budget to get it started, and a TV state of the nation address by Kenny outlining what has to be done and explaining why. Instead of tackling the problem head on, the government over the past 100 days has tried to float above it, as though it doesn't exist. Instead of bold action, we have got lame assurances that we can still manage the situation by making minor adjustments here and there, as well as a lot of confusion. An example of this confusion came, appropriately enough, in Kenny’s 100-day press conference. Kenny was asked about the statement by the Minister for Finance Michael Noonan in the Dail (Parliament) a couple of weeks ago that, because of the difficult economic situation, he could not rule out tax increases in the budget later this year. "As head of the government ... and this is very clear ... there will not be any income tax increases in the budget," Kenny said last Thursday. 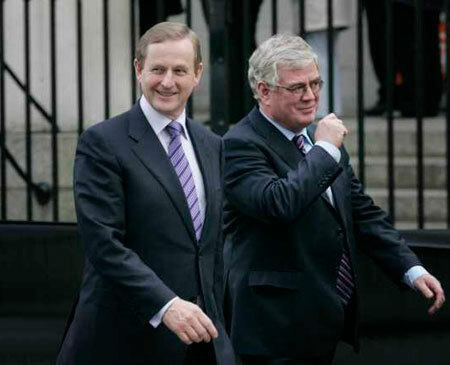 Standing beside him, Tanaiste (Deputy Prime Minister) Eamon Gilmore added to this by guaranteeing that there would not be any decrease in unemployment benefit in the budget either. So whether people have a job or don't have a job, their income will not be cut this year, Gilmore explained. Of course Kenny was talking only about income tax, and there are a lot of other taxes and charges that can be imposed. But it was hardly the right message for either him or his deputy to be putting out there. It carries the implication again that we can muddle our way through this without feeling any real pain. And that's just not true. Meanwhile Noonan, the man they were undermining, was in Washington last week telling the media that we are going to burn some senior bondholders no matter what the European Central Bank says. We have already burned a lot of the subordinated bondholders in banks here. But the EU has insisted as part of our bailout deal that we cannot touch the senior bondholders. To do that could shatter confidence across Europe, the European Central Bank (ECB) says. And of course the ECB itself has lent us an awful lot of money. Noonan has now grasped this nettle and said that the senior bondholders who gambled on our two riskiest banks must pay the price. The two, Anglo Irish and Irish Nationwide, have been taken over by the state and wound down and are not banks any more, Noonan said. So the senior bondholders in these failed institutions are in a different position because the banks no longer exist. They can be badly singed, if not burned alive. All of which is entertaining stuff, but we have yet to see how the ECB will react to this. I hope for Noonan's sake that when the pressure comes on from Europe, Kenny doesn't do another one of his smiling climbdowns. Also, although Noonan's solo run in the U.S. was welcome, it's not just senior bondholders in the two basket cases that should be burned. The senior bondholders in all our banks should feel the heat because they have all failed. Only Bank of Ireland remains outside state control and that is teetering on the brink. The idea of burning senior bondholders is supposed to be completely unacceptable, of course. The ECB and others say it could undermine confidence in the whole banking system in Europe. But how come it's acceptable to burn shareholders in banks and roast Irish taxpayers so that senior bondholders can be insulated from the fire? Senior bondholders include major pensions funds, the argument goes, so you can't burn them. But most of the shareholders in our banks are pensioners as well. Some heartbreaking stories have emerged in recent weeks here about old folk who put all their savings into bank shares so that the interest would pay for their care homes. Some of them spread the risk by buying shares in the two biggest banks, AIB and Bank of Ireland, instead of just in one. Now both are virtually worthless, and these old folk cannot pay for their care anymore. Their life savings have been wiped out. Why should they -- and the taxpayers -- be taking all the pain? Surely we should spread the pain around by including all senior bondholders in the mix as well? Whether Noonan -- and his government colleagues -- have the bottle to do anything like that remains to be seen. Certainly the record of the first 100 days would not fill you with confidence. Remember all that stuff before the election about how we had lost our economic sovereignty and they were going to take it back. It would be Labor's way, not Frankfurt's way. It would be a lower interest rate on the bailout. It would be a five point plan to get us back on our feet. It would be a jobs budget to introduce a whole new approach to create 100,000 jobs. It all sounded great and the electorate bought it. They only half believed it but they wanted to dump Fianna Fail, so they went with it anyway. Now, 100 days later, we can see that it was all a bottle of smoke. The new government policy is exactly like the old government policy. Before the election the incoming government asked to be judged after their first 100 days. Well, on the two big issues, the report card has to give two Fs. Europe has refused to cut the interest rate on the bailout. And if we do get a cut -- or an extension in the term -- it's not likely to be big enough to make much difference. So much for Kenny's special relationship with Angela Merkel. What has also become clear over the past 100 days is that we cannot sneeze without the permission of the EU and the IMF, unless we want to risk the money taps being turned off. The EU-IMF made it clear to the new government that they could fulfill any of their election promises, as long as they were budget neutral. In other words, no extra spending unless there's a corresponding cut. So the great plans for a jobs budget to create 100,000 jobs was watered way down to a jobs initiative, which may or may not create a few thousands jobs, and that is being funded by an extra tax on the pensions of private sector workers. What has also become clear in the first 100 days is that servicing the enormous bad debt of the banks is so costly that there's no money left to do anything. The only way out, as Professor Morgan Kelly said, is to take the hard decisions quickly. The first 100 days has shown that this government, in spite of its huge majority, just does not have the courage to do that.